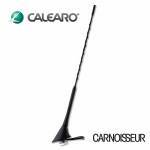 Calaero's latest generation of aerials combine the most up-to-date technology, with reliability and timeless design. Drawing on their years of antenna engineering experience, they have produced an aftermarket range that is simple, elegant and easy to install. Most of our Outlets will be able to offer a fitting service for Calaero Aerials - please contact your local Outlet to find out more.